Hypnosis – (noun): 1. a trancelike state that resembles sleep, but is induced by a person whose suggestions are readily accepted by the subject 2. an artificially induced state of relaxation and concentration in which deeper parts of the mind become more accessible: used clinically to reduce reaction to pain, to encourage free association, etc. The public’s understanding of hypnosis has advanced a great deal in the past century, but the phenomenon is still misunderstood by many. To some, the word hypnosis still conjures the image of the mysterious hypnotist waving a pocket watch back and forth, guiding his subject into a zombie-like state and compelling the entranced subject to obey his ominous bidding. ­This representation, as popularized by the story of villainous hypnotist in the movie “Svengali”, bears little resemblance to actual hypnotism. Contrary to the popular misconception that hypnosis is a form of unconsciousness resembling sleep, research suggests that hypnotic subjects are actually awake and focused in a state of physical relaxation, with increased mental concentration and decreased peripheral awareness. Never truly under the dominating control of the hypnotist the subject maintains his or her free will. The hypnotic state is induced by a procedure known as a hypnotic induction, which is commonly accomplished by a series of relaxation instructions/suggestions. Hypnotic suggestions may be delivered by a hypnotist in the presence of the subject, or may be self-administered. The use of hypnotism for therapeutic purposes is referred to as "hypnotherapy", while its use as a form of entertainment for an audience is known as "stage hypnosis". ﻿The story of hypnosis began in ancient times when it was used it for healing purposes within religious ceremonies. Hypnotism as a tool for health was known to the Hindus of India, as well as the people of ancient Egypt andGreece, who often took their sick to sleep temples to be cured by hypnotic suggestion and visualization in order to “will” the sick person back to health. Hypnotic-like inductions were used by ancient seers and tribal shamans to enter into an "﻿﻿ecstasy﻿﻿” sleep in order to commune with the gods and spirits of nature. But, the story of hypnosis took a strange turn in the late 18th century through the work of one of the most controversial scientific figures in history, Franz Anton Mesmer.0 . One cannot mention the name of Franz Anton Mesmer without setting off a firestorm of controversy. To some Mesmer was the “father of hypnosis” who provided Freud and modern psychology with its greatest tool for psychoanalysis and to others Mesmer was merely a medical quack, exposed as a poor deluded occultist by Benjamin Franklin. To understand who and what Mesmer really was you must begin by accepting the idea that both views are correct. 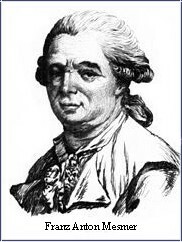 Franz Anton Mesmer was a German physician with a fascination for astrology who believed that “all living beings had “energy fields” within them, which could be influenced by the planets and he theorized that a universal magnetic fluid existed in all “objects that produced disease when it was out of balance in the human body”. In the early 1770s, Mesmer met Maximilian Hell, a Viennese Jesuit and healer. Father Hell was apparently able to cure people through a process of “magnetic healing” using a magnetic steel plate. Mesmer latched on to this idea. Mesmer came to believe that whenever a magnet was brought into contact with a patient, the subtle and mysterious fluid exuded by the magnet entered the body of the patient and healed him of his complaint. “Animal magnetism” was the name Mesmer gave this effect and he called his way of curing people with this method “Mesmerism”. Mesmer would often have his subjects standing on a magnetic plate submerged in a pool of water. He told them that they could only be cured if they were able to focus on the heavenly powers that existed within their bodies and he entreated them to reach further into their minds and yield themselves to the magnetic fluids about. He walked around them touching each one with a metal wand and perhaps through the electric shock brought about by the grounding effect of the wand to the subject standing on the magnetic plate produced what Mesmer called “a grand crisis”. What today may be recognized as the type of grand mal convulsive seizure experienced by patients undergoing electroconvulsive therapy (ECT ) treatments. Mesmer eventually discovered that he could get the create the same effect without the magnets, using what we might attribute to the power of suggestion as used today with hypnosis and the “healing touch” of the energy flowing from his own body. Mesmer traveled to Paris in 1778, a Mecca at the time for many different mystic and spiritual prophets. He soon became very popular among the upper classes and members of the French court. Mesmer held special salons in which he would use his hands to channel the invisible magnetic fluids to his subjects. 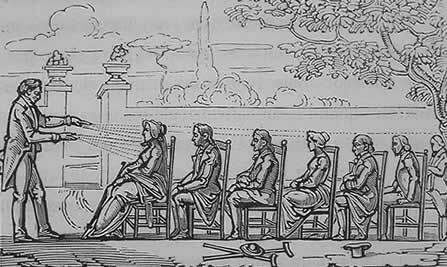 A combination of light, music, and incantations from Mesmer produced this form of hypnotism or "Mesmerism." He had soon developed a reputation as a miracle-worker, able to cure most any malady in his patients. Mesmer tried and failed to get either the Royal Academy of Sciences or the Royal Society of Medicine to provide official approval for his doctrines. He found only one physician of high professional and social standing, Charles d'Eslon, to become a disciple. In 1779, with d'Eslon's encouragement, Mesmer wrote an 88-page book "Mémoire sur la découverte du magnétisme animal", to which he appended his famous 27 Propositions which outlined his theory at that time. Unfortunately for Mesmer, France in the 1780’s was a very dangerous place to be, especially if one became associated with the court of King Louis XVI. There was already a good deal of public unrest in France and in Paris in particular and the French Revolution was starting to boil. Any suggest of intrigue could mean a sudden and dramatic fall from grace. It was alleged that Mesmer was seducing the women of the court and some of these women were said to have been seduced while in a vulnerable state of relaxation brought on by Mesmer’s techniques. 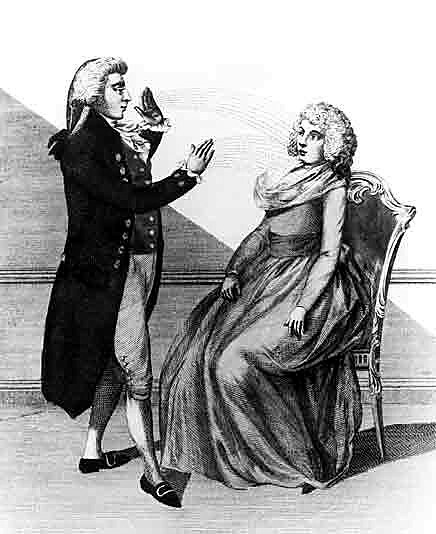 It was even suggested that Queen Marie Antoinette, who was enamored of Mesmerism, if not Mesmer himself, might be involved. This, along with the animosity felt toward Mesmer by the French medical establishment of the time, put Mesmer and the King in a very precarious situation. In 1784 King Louis XVI commissioned the French Academy of Sciences to investigate Mesmer and his claims of miraculous cures, led by the leading scientific figure (and celebrity) in Paris at the time, Benjamin Franklin. Mesmer was concerned that he was being be subjected to a political “witch hunt” and he refused to cooperate. Franklinwas skeptical of what he saw as Mesmer’s wild claims, but this was considered the healthy attitude of an enlightened truth seeker. It must be remembered though that Franklin was in France at the time as a representative of the American Colonists seeking financial and military support for the American Revolution. His fellow delegate in Paris, John Adams was extremely concerned at the time that Franklin himself had been “seduced” by the French court. As the leading celebrity in France at the time Adams believed that the public adoration had gone to Franklin’s head and his vanity had gotten the better of him. Franklin was not averse to seizing every opportunity to increase the public’s adoration of him, often at the expense of others, including Adams. Additionally, Franklin’s estranged loyalist son William Franklin, the Royal Governor of New Jersey, was a devotee of Mesmer, so it is a possibility that Franklin may not have been as unbiased an observer as Mesmer needed to decide his fate. The commission’s findings concluded with a rejection of Mesmer’s new force of physics claim saying that there was no scientific evidence of animal magnetism and they warned the King that women were put in a vulnerable state by the techniques of a man that might take improper sexual advantage. Mesmer was driven into exile soon after the investigations on animal magnetism and the last twenty years of his life were spent in obscurity. He died penniless, in obscurity in 1815. Though Mesmer himself was, for a time, discredited and forgotten to many researchers Mesmerism itself was not. The transition from Mesmer's animal magnetism to modern therapeutic hypnosis began in 1843 with British surgeon James Braid, who coined the term “hypnosis”, from “Hypnos”, the Greek god of sleep. Braid recognized in hypnosis certain legitimate psychological phenomena of interest, requiring more systematic investigation in order to be understood. In the early scientific study, Braid at first thought that hypnotic induction would yield a unique condition of the nervous system that was linked somehow to certain cures by suggestion. 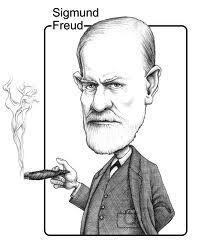 In 1889 Sigmund Freud, who had a deep interest in hypnosis for much of his life, began to use hypnosis as a means of bringing out repressed memories in patients. Their work, along with that of many others, had led to the type of hypnosis we are familiar with today, as medically used for hypnotherapy, as well as pain management, relaxation, habit and phobia control and other applications. But, perhaps this is only one part of the legacy of Mesmer. Though the legacy of Franz Anton Mesmer seems to be that the scientific study and application of hypnosis, as a medical tool, was born out of Mesmerism, but it may possibly be that although the baby was not thrown out with the bath water, by concentrating on hypnosis alone as a medical treatment, the baby may have been thrown out and only the bath water saved. The discrediting of Mesmerism by Franklin’s commission did not come about because Mesmer had not been able to prove that he was able to produce the results with his subjects that he claimed, but that he had failed to prove that “animal magnetism” was an actual physical force. Partially, this was because Mesmer refused to sit down with the committee and attempt to explain what animal magnetism was, but even if he had tried he most likely could not have done so, as he did not truly understand it himself and Western philosophy had no precedents for understanding it either. He would have been preaching to the wrong crowd. If Mesmer had been in China and not France there is a very good chance that the crowd would have understood what he was saying. His concepts of “animal magnetism” and “magnetic fluid” might well have resonated with them in the context of Oriental philosophy and their concept of Qi (or Chi) energy. 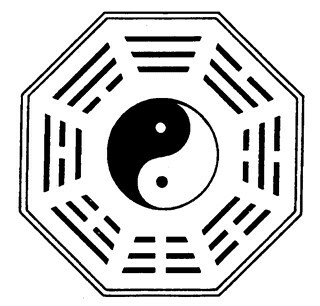 Ancient Chinese philosophy describes “Qi” as "life-force". It is believed Qi permeates everything and linked all things together. It is likened to the flow of energy around and through the body, at molecular, atomic and sub-atomic levels. Traditional Chinese medicine asserts that the body has natural patterns of Qi that circulate in channels called meridians. It seems probable, that the “force” that Mesmer observed and described from a Western perspective as “magnetic fluid” and “animal magnetism” is in fact what is seen from the Eastern perspective as “Qi”. It follows then that when used as a separate medical treatment, independent from the treatment of the bioelectricmagnetism inherent within the practice of Mesmerism, hypnosis becomes only one disconnected part of the holistic approach to health that Mesmer seemed to be intent on discovering. Perhaps it is time to revisit the work of Franz Anton Mesmer. If the concept of the “life force”, as suggested by Mesmerism and Traditional Chinese medicine, is not incorporated into the Western idea of medical treatment and a recognition of the role played by bioelectricmagnetism in the body is not seriously examined then perhaps those practitioners of Western medical disciplines will never develop the need for a holistic approach to the treatment of disease as Mesmer seemed to be sensing and Traditional Chinese medicine practitioners understand.